Health Equations’ electroLYTES™ contains six major electrolytes and 65 readily assimilated trace minerals that charge and electrify cells, increasing energy and vitality. Use electroLYTES™ to increase hydration, mental acuity, physical performance and stamina, digestion, adrenal and liver function and detoxification. No artificial colors, no preservatives, no sweeteners, no GMOs! Our electroLYTES™ contains six major electrolytes and 65 readily assimilated trace minerals that charge and electrify cells, increasing energy and vitality. Use electroLYTES™ to increase hydration, mental acuity, physical performance and stamina, digestion, adrenal and liver function and detoxification. Drink reconstituted electroLYTES™ with meals to aid digestion. 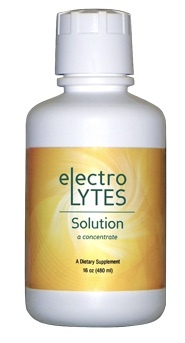 electroLYTES™ in combination with Malic Acid provides acid for digestion. Each 16 oz. bottle of HEq electroLYTES™ Solution Concentrate contains 64 servings.